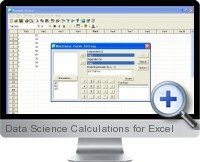 The Data Science Calculations application (DAVS) is independent of Excel but allows to import and export Excel data. Calculations are focuses on data science and mining through a library of statistical functions that also allow to visualize relationships and outputs. The solutions supports a large number of input variables and provides high quality visualizations in up to 4 dimensions. Easily import and export Excel and flat file data. Data can be editing within the application in a similar way to Excel. Implement multivariate statistical analysis over all of subsets of imported data. Probability analysis includes density functions, cumulative distribution, survival, hazard, quantile values, means and variances. A wide range of options for frequency analysis, t-tests, z-tests, and ANOVA variance. Non-parametric tests include one/two sample Chi-square, one/two sample K-S, sign, Wilcoxon signed rank and Mann Whitney U tests. Multivariate and univariate regression analysis perform linear and nonlinear curve fitting, trend surface analysis and stepwise regression. Correlation can be analyzed under partial, bivariate and canonical methods. Stepwise, hierarchical and dynamic cluster analysis identifies relationships for predictive analytics. Additional functionality includes stepwise discriminant analysis, principal component analysis, factor analysis, correspondence analysis, statistical plots and advanced data visualization.